Continuing with the face basics, for the second month in a row I have been obsessed with the Too Faced Pimed & Poreless Translucent Powder. This stuff is just a.m.a.z.i.n.g!! I won’t go into much details cuz I have a full review on it but I love how finely milled and light it is. It adjusts to my skin tone and minimizes the appearance of pores, which is really important for me. It mattifyes the skin without making it look powdery or cakey and sets my makeup for hours! LOVE it and can’t recommend it enough for, especially for the summertime! Overall, May was a really lovely month beauty wise and I hope you enjoyed my favorites. I definitely recommend checking them all out now let the summer days roll in! <3 Have a fab week and I’ll see you soon! I just always adore your photos, they're so beautiful! Essie Fiji is my all time favourite polish which is why it's one of the prizes in my give away :) I'd really like to try the Chanel foundation too! I reviewed the Apocalips.. It is fantastic isn't it. I love so many of your favourites! I have the Too Faced Bronzer in the slightly darker shade and love it so much! I'm in LOVE with Nova as well :) it's such a perfect pink colour! I just bought Apocalips in Galaxy and am obsessed already! 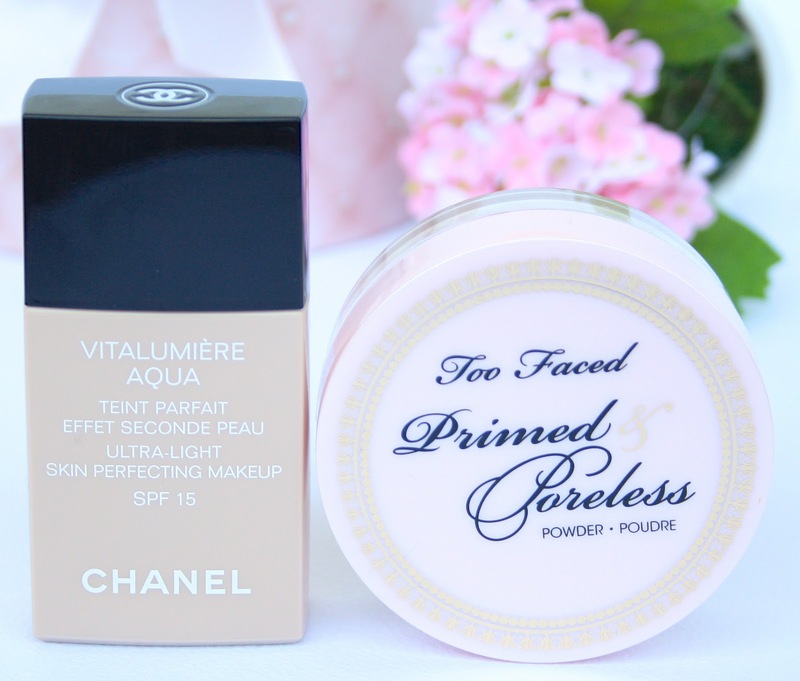 Glad to see other people love the Too Faced bronzer too, I always want a matte bronzer and it took me ages to find one pale enough for me so this one is perfect :) I really want to try Essie Fiji and the Chanel foundation too! 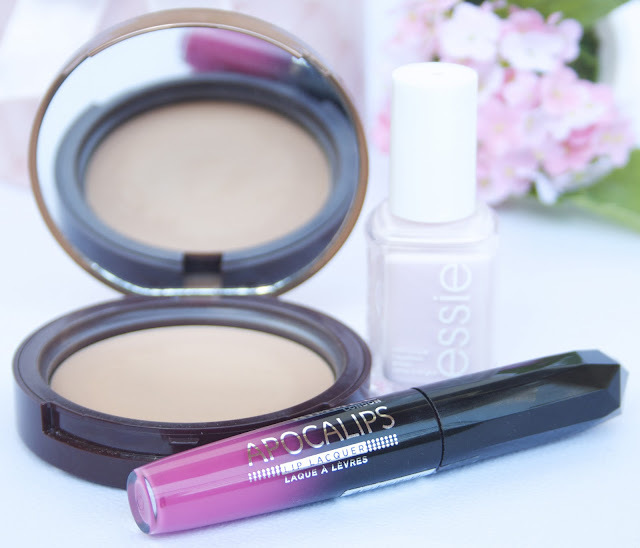 Apocolips are my new favourite lip lacquers! Nova is a stunning colour as well. I love that Essie colour too. Amazing! I really want to try that foundation! It's sounds amazing! I also love Vitalumiere Aqua! Apocalips lipglosses look so nice and pigmented, need to try them. Thanks for checking out my blog :) Followed you! Lovely post, as always. I haven't tried the infamous Chanel V.A foundation but I've been lusting for a while! And I've seen these Rimmel glosses e.v.e.r.y.w.h.e.r.e, I need to get my paws on one, they looks so amazing. I've been loving Fiji as well!! Its an amazing color!! I should go and try out the Too Faced Bronzer!! I've read so much about it!! I've been meaning to pick up an Apocalips for a while now. I love how pigmented they are. Thanks for checking out my blog. I really like yours and have followed you. I was thinking of purchasing the Chanel Vitalumiere Aqua Foundation but I usually just wear a BB cream. What kind of brush do you apply it with? I have this Chanel foundation and I love it!! It looks so natural on too. I love Rimmel London Apocalips Lip Laquer I have it in luna and I wear it so much! Also the colour of the essie nail polish is so pretty! The bronzer looks great, if you're looking for another matte one, I'd recommend Benefit's Hoola. That was in fact my first bronzer and I was equally blown away by it as you are with yours. It doesn't have a great smell, though, but I love it anyways, it's not an overly dark shade, either. I loveee Chanel Vitalumier AND Essie Fiji! Great choices! Just discovered your blog and I love it, new follower! That apocalips is to die for... I really hope I can get my hands on one! Hello beautifull im following u nOw! i love your photos! so pretty! really nice products! Love the too faced primed and poreless face primer! It glides on your face so softly, it's amazing. And the chocolate solei bronzer! I have that as well, I actually dropped it and broke it to pieces :( But it still works fine when applying. I love the smell of it too! 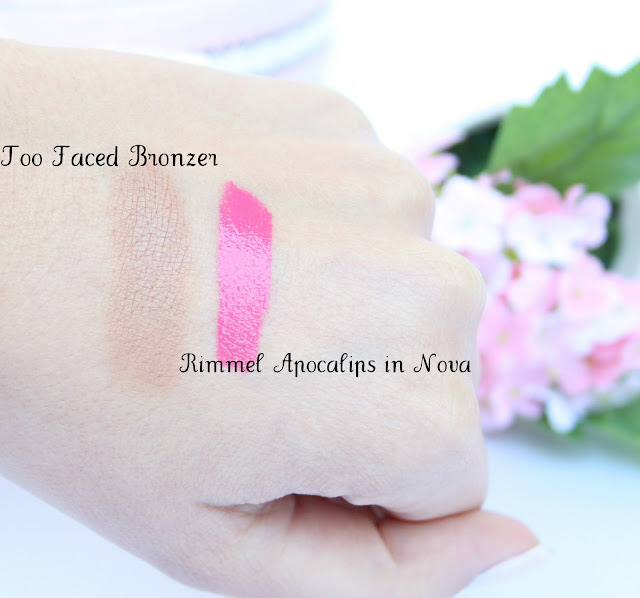 Would love to try out the Too Faced bronzing powder and OhmyWow, the Apocalips pink nova is a sensation, must find it here! I adore the Too Faced bronzer! I can't stop wearing it! 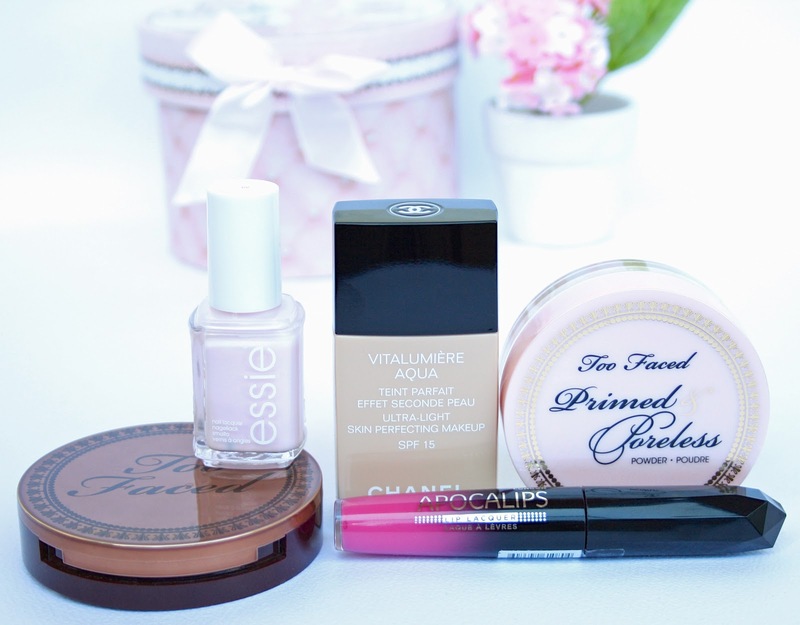 All your May favorites are gorgeous! Lovely products! I admire your photo quality!! What equipment do you use? I heard SO many good things about the Chanel foundation, maybe I just have to splurge out and get a bottle for myself! I had the Chanel Foundation 2 summers ago and never repurchased it but recently i have been looking into it again as it was my favorite go to foundation in summer! 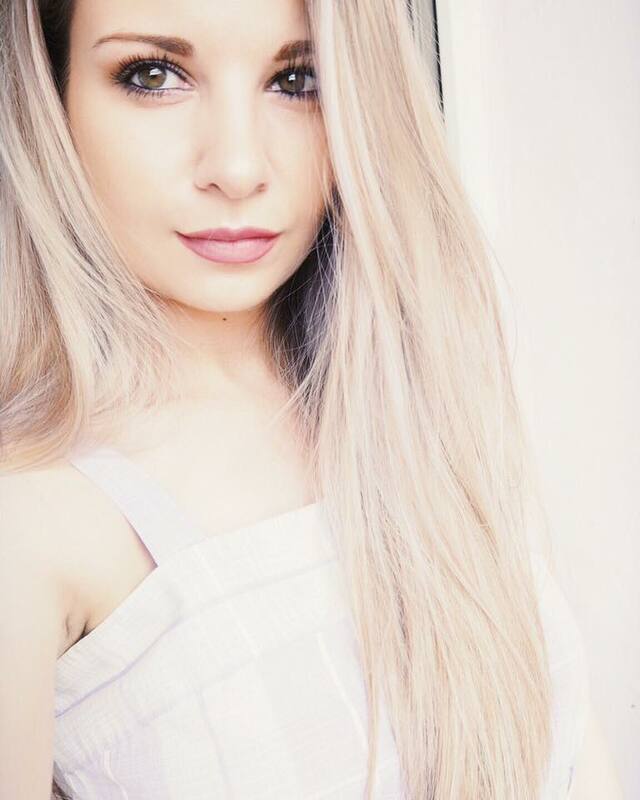 You have Such a gorgeous blog darling! thanks for your sweet comment on my blog! i just started following you, I've been wanting to try a Chanel foundation lately and just might reach for the one featured in this post. Thanks for reviewing it! I am dying to the have the rimmel apocalips! Great colors!